This post is sponsored by UNCLE BEN’S®. 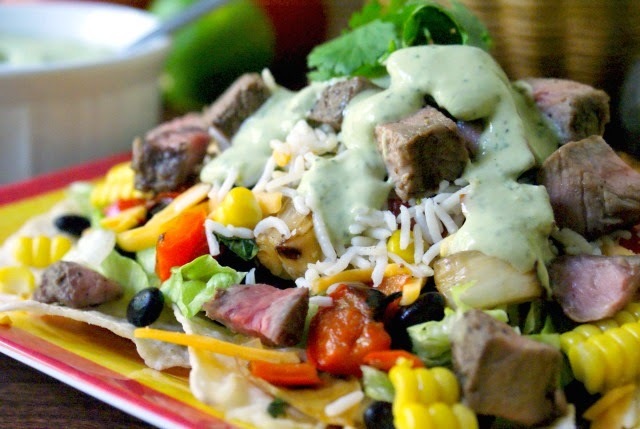 Grilled Steak and Rice Taco Salads with Creamy Avocado Cilantro Dressing are healthy and delicious, topped with cilantro lime rice, juicy sirloin steak and fresh grilled vegetables, then finished with a smooth and creamy avocado and greek yogurt based dressing. One of my sweet little nephews is just shy of turning two. It's such a fun age for little ones who are exploring the world and finally learning to communicate. The small handful of words that kids can speak at such a young age are pretty limited: words like Mama, Dada, more, no, ball, milk, and uh-oh are pretty common. That is unless you are a part of my Texas-dwelling Mexican food-loving sister's family. Know what's in my nephew's repertoire of words? Taco and salsa. The kid is a pretty smart cookie and apparently a budding foodie. Making me proud. We have always loved ethnic flavors in our family, especially anything having to do with tacos! When I was a kid, taco salad night was so much fun. My sisters and I all got to customize and assemble our salads with the toppings of our choice. If you know anything about kids and food, then you know that when they're given the chance to be hands-on in the kitchen, they are more likely dig in and try all kinds of healthy fare. Taco salads are no exception. Loaded with fresh veggies, they are an excellent and healthy choice that the kids and adults will both love. I was inspired by UNCLE BEN’S® Grilled Steak and Vegetable Tacos with Cilantro Lime Rice when I made this version of a taco salad for my family. I loved the idea of seasoned basmati rice on my taco salad and I knew that the subtle hints of lime and the bright flavors from the cilantro would fit right in. I prepared the rice in a foil packet on the grill to cook alongside the steak. Easy peasy. I also loved that the recipe included grilling some fresh veggies. I chose to grill up some bright red bell peppers, sweet onions and juicy corn put on my salad. 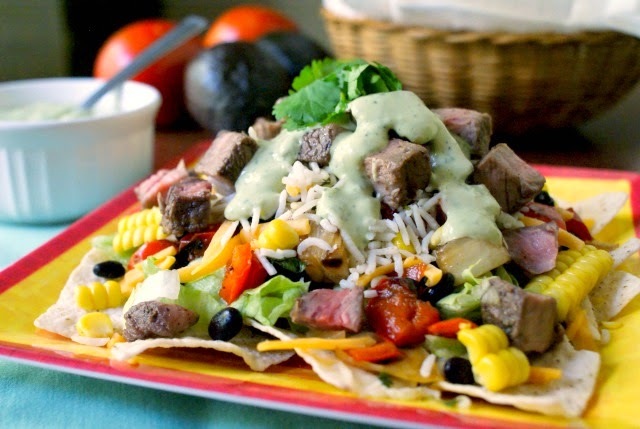 The flavorful rice, smoky grilled steak and veggies, and the hearty black beans and sharp cheese all topped a bed of crisp lettuce and tortilla chips. I finished it all with a cool and creamy avocado dressing. This is no ordinary taco salad, friends. So many harmonized flavors and freshness in every bite. It was nothing shy of fabulous. You can make 5-6 small taco salads using this recipe or a couple really big ones for family-style sharing! I know you'll love it! In your food processor, blend all of the ingredients for the dressing. Set aside. Season steak with salt, pepper, and chili powder and rub with oil. Tear off a piece of aluminum foil 12-inches long. Pour rice onto foil and top with 1/2 cup of chopped cilantro, 2 tbsps water and the juice of half a lime. Fold up into a packet. Grill the steak, peppers, onion, and corn (see notes for corn preparation suggestions) on preheated outdoor grill approximately for 8 minutes (corn will need to be flipped a quarter turn every couple of minutes). Flip the steak, onions and peppers and add the foil pack of rice to the upper rack of your grill. Continue grilling for an additional 8 minutes or until the meat is cooked to medium and the vegetables have softened and lightly charred. Remove everything from the grill. Chop the grilled vegetables and steak into bite-sized pieces and cut the corn off of the cobs. 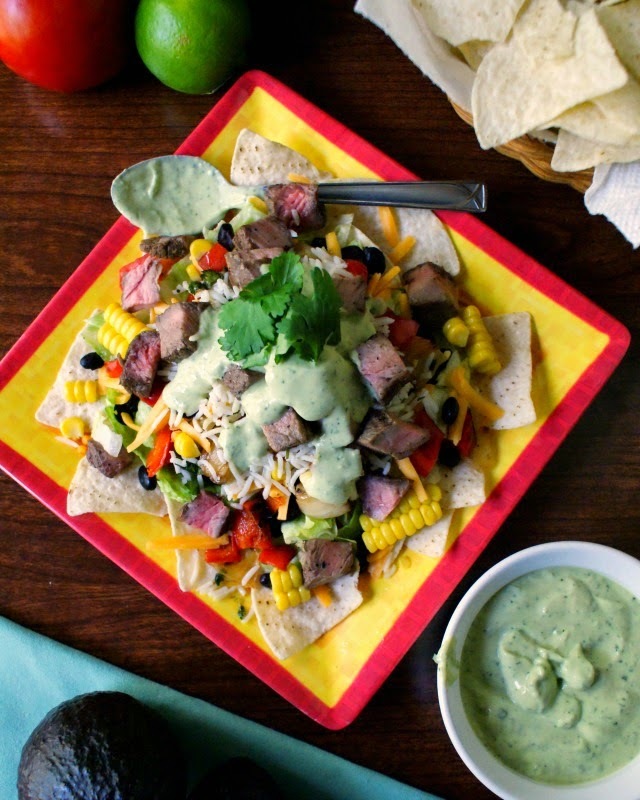 Assemble the taco salad by layering the meat, veggies and rice. Top with the dressing. Use additional olive oil or water thin the dressing to your desired consistency. You can grill your corn right in the husks if your corn is super fresh. The outside will char, but the inside will cook nicely. Remove the husk and silk after grilling. My store had partially husked corn, so I removed the husk and silk then wrapped the corn in foil and grilled it that way. My family's tradition is to make taco salads with a layer of tortilla chips under the salad (kind of like nachos). If you prefer, you can crush some and sprinkle on top of the salad or omit them and serve the salad in a tortilla bowl. This post is sponsored by UNCLE BEN’S®. All thoughts and opinions, as always, are 100% my own. Thanks you so much for your kind words, Julie! If you do try it, I hope you love it as much as I did!